Delivering classic Peavey tone, the MiniMEGA features 1,000 Watts of power and produces incredibly full and rich sound in a compact package that weighs in at only 9 lbs. Using technology not found in other bass amps, the MiniMEGA represents a new level of compact bass amplifier performance. Peavey's proprietary KOSMOS® enhancement provides increased bass impact, while the exclusive psychoacoustic low-end enhancement adds bass without overburdening speakers -- a testament to Peavey's technology-driven innovation. The MiniMEGA contains additional modern features such as built-in compression and a 4-band EQ with semi-parametric mids. 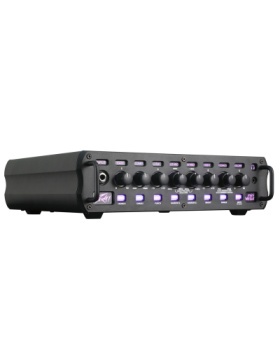 The back panel of the MiniMEGA has all the connectivity necessary to patch in effects or connect to a sound reinforcement system. Complete with an effects loop, gain control, crunch button, tuner output and more, the MiniMEGA delivers the high level features that today's professional bass player demands. Ideal for use in any live or studio setting, the MiniMEGA is the go-to amplifier for bassists of every style.